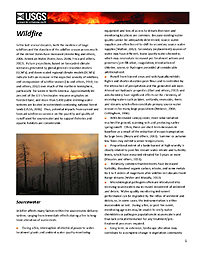 In the last several decades, both the incidence of large wildfires and the duration of the wildfire season across much of the United States have increased (Westerling and others, 2006, American Water Works Assn, 2008; Finco and others, 2012). Future projections, based on forecasted climate scenarios generated by global general circulation models (GCM's), and down-scaled regional climate models (RCM's) indicate both an increase in the expected severity of wildfires, and an expansion of wildfire season (Liu and others, 2010; Liu and others, 2012) over much of the northern hemisphere, particularly for western North America. Approximately 80 percent of the U.S's freshwater resource originates on forested land, and more than 3,400 public drinking-water systems are located in watersheds containing national forest lands (USDA, 2006). Thus, potential impacts from current and forecast wildfire occurrence on the quantity and quality of runoff used for sourcewater and to support fisheries and aquatic habitats are considerable. Download the complete briefing document [280KB PDF].